When I think of sweet potato casserole, images of brown sugar, butter, and mini marshmallows come to mind. 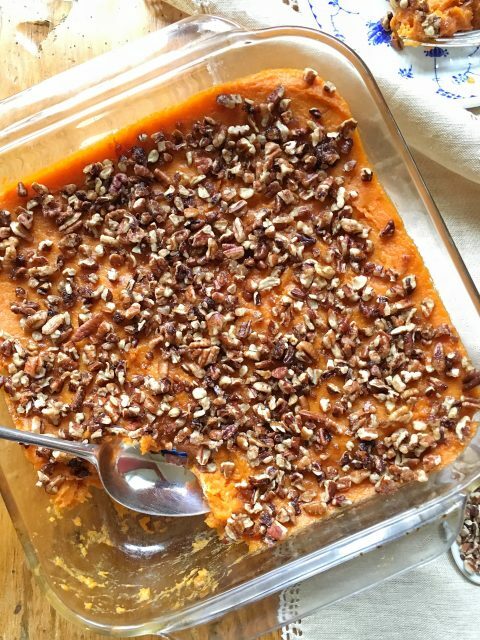 It’s one of those traditional side dish recipes most families gobble up at Thanksgiving, but the sugar, fat, and calories can add up quickly. 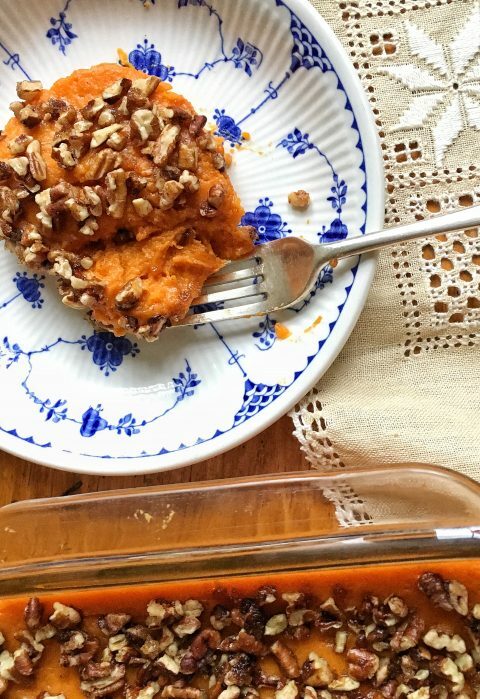 My sweet potato casserole makeover will bring better nutrition and just as much flavor to your holiday table. 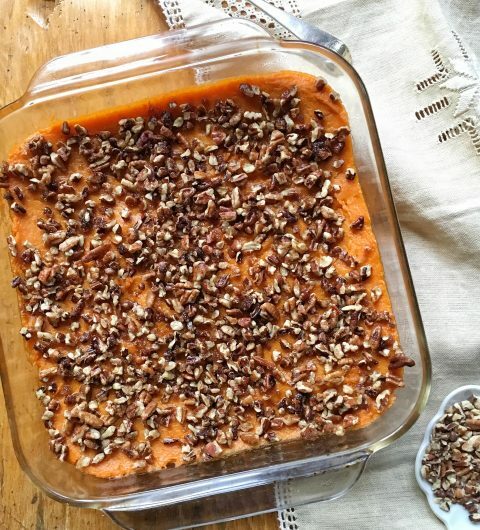 Sweet potatoes are rich in immune-boosting vitamin A, and they’re a good source of vitamin C, potassium, and fiber. Why wreck all that great nutrition with a bag of mini marshmallows! 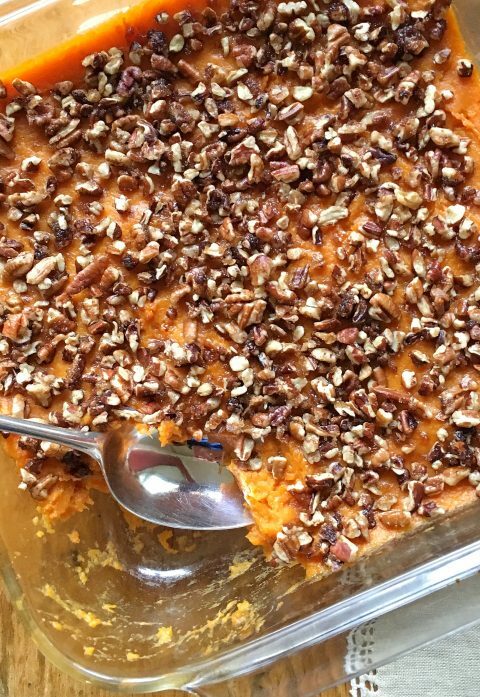 To maintain its healthy reputation, I give sweet potato casserole a “fix” by adding just 2 tablespoons brown sugar and 2 tablespoons coconut oil to the entire recipe. And my topping is made with nutrient-rich pecans versus the usual sugary marshmallows. This recipe is easy to make, naturally sweet, and at just 180 calories per serving, it’s a side dish worth making again, and again, and again! Have you listened to the Liz’s Healthy Table podcast yet? 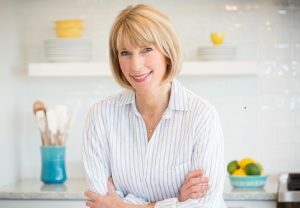 The show is aimed at helping families and foodies eat a healthy and delicious diet. 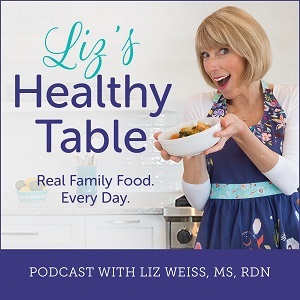 Topics and guests cover everything from eating healthy on a budget and ideas for adding interest to your Instant Pot recipes to the power of fermented foods and the benefits of adding more pulses to your everyday meals. I hope you’ll tune in! At Thanksgiving dinner, I like to take a little of this and a little of that. So even though I say this casserole serves 8, at the holidays, it will likely yield 10 servings. 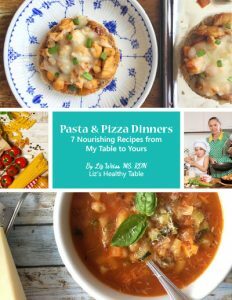 Depending on the number of guests at your table, you may want to double or triple the recipe. And if you prefer the flavor of butter to coconut oil, go ahead and make the swap. Preheat the oven to 400°F. 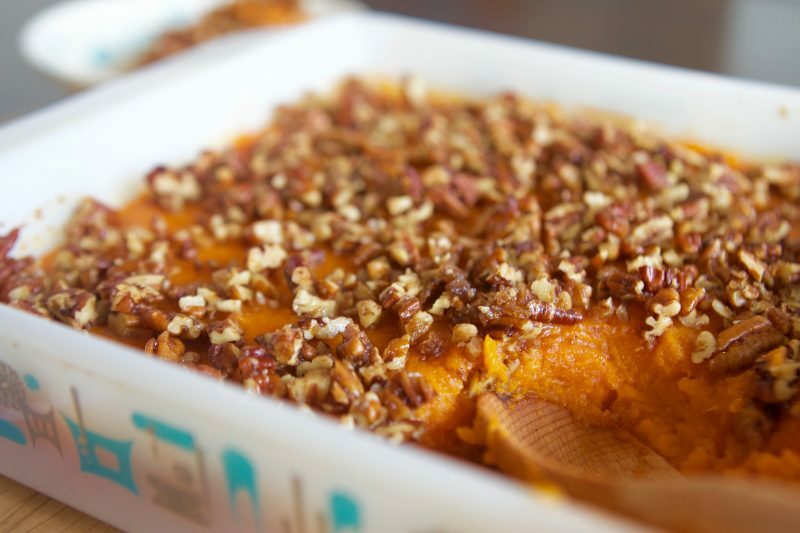 Place the sweet potatoes on a foil-lined baking sheet. Pierce each potato several times with the tip of a sharp knife. Brush the potatoes with 1 tablespoon of the coconut oil and sprinkle with a pinch of kosher salt. Bake until very tender, 45 minutes to an hour. Remove from the oven and reduce the heat to 350°F. When the potatoes are cool enough to handle, cut them in half, scoop the flesh into a bowl, and mash until smooth. (You will have about 4 cups.) Stir in the orange juice, 1 tablespoon of the brown sugar, orange zest, ¼ teaspoon of the cinnamon, salt, and ginger. 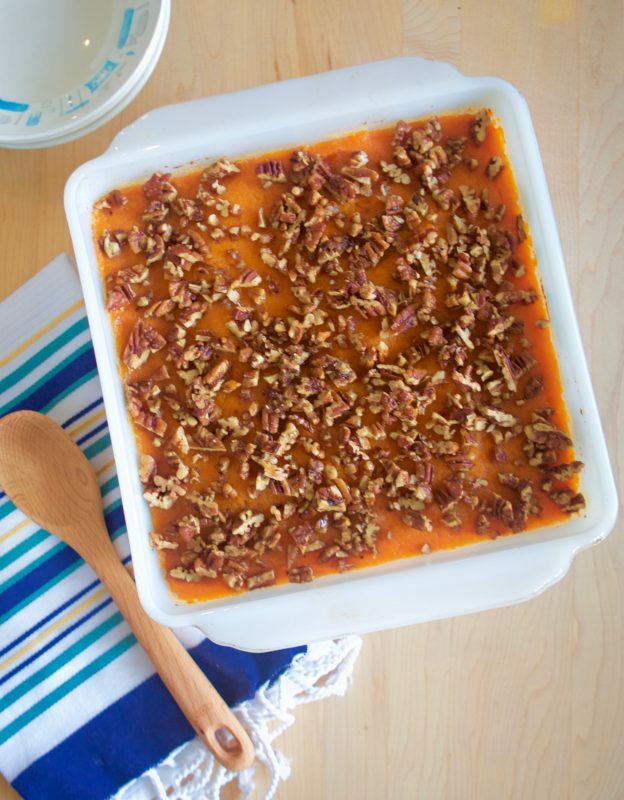 Place in an 8 x 8-inch baking dish and smooth the top with a rubber spatula. To make the topping, place the remaining brown sugar, coconut oil, cinnamon, and the pecans in a bowl and stir to combine. Sprinkle the mixture over the sweet potatoes. Bake until the nuts are toasted and the casserole is heated through, about 30 minutes. 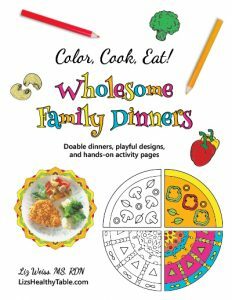 Tell me about your favorite holiday side dishes!